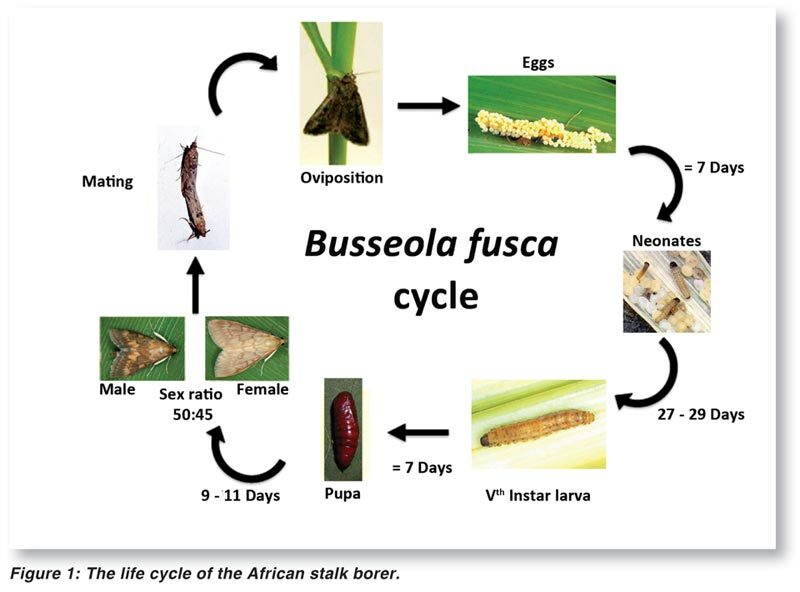 The African maize stalk borer larva or in the Latin binomial classification system is known as Busseola fusca and is indigenous to Sub-Saharan Africa. The larva or caterpillar stage in the life causes major damage to maize and sorghum crops throughout the region and in particular South Africa. It occurs from sea level to production areas at 2 000 metres above sea level. If not controlled effectively crop losses for large commercial producers as well as small scale farmers can be between 5% and 30%, or more, of the potential yields. Larva damaged kernels in the maize ears allow and facilitate infection by various fungi. At harvest the resulting bad quality of the seed might result in your whole crop being downgraded. At a maize price of R2 800 per ton and an average yield of 4,5 tons per hectare the potential economic damage could range from R630 to R3 780 per hectare. Please see the life cycle shown in Figure 1, so that you can become familiar with the various stages of the African stalk borer so that you can identify various stages of the pest in your own maize lands. The young larvae or caterpillars lack conspicuous hairs or markings, are creamy white with a distinctive grey tinge and occur sometimes with a pink infusion in colour. The head capsule is dark brown with a yellowish brown body and its breathing hole or spiracles are elongate with black edges. They have four sets of prolegs, all next to each other along the abdomen. The adult larvae hibernate as pupae in the base of the stem left on the land as stubble during the winter. These will emerge after winter and be the first generation of moths to lay eggs within the sheaths of the leaves of young maize plants less than two month old. The eggs will hatch after 7 to 10 days and continue the cycle. An emerging larvae feeds for six weeks, then forms a pupae which after an additional three weeks emerges and creates the second generation of moths. In the current drought cycle the first and second generation of moth’s flights might be delayed by many weeks. The adult moths have a wing span of 25 mm to 35 mm, with light brown to dark brown forewings as well as darker markings. The hind wings are white to grey-brown. The adult moths lay creamy white eggs which darken just before emergence. The eggs are about 0,8 mm - 1 mm in diameter, hemispherical and slightly flattened. When scouting for egg batches or clusters of eggs of between 30 and 100 eggs can be seen under the emerging leaf sheath. It is wise to continually check the leaves of maize crops under two months of age so that an early warning for a possible high infestation can be observed and reacted on early enough. The moths fly at night at about knee height and will thus land on any maize plants higher than this and lay their eggs in the emerging leaf sheaths. The first signs of early damage usually noticed are the small holes or ‘shot’ phase caused by the smaller caterpillars on the leaves. These holes resemble the effect that would be caused by the spray of shot gun pellets if shot at an object. If these are observed you probably already have an infection rate that will exceed 10% damage to the crop. Dead heart is also one of the first symptoms to be noticed by farmers as the central leaves at the top of the plant become drier and withered and may even flop over to the underside of the growing maize plant. Control must be implemented as soon as possible if the above are observed. 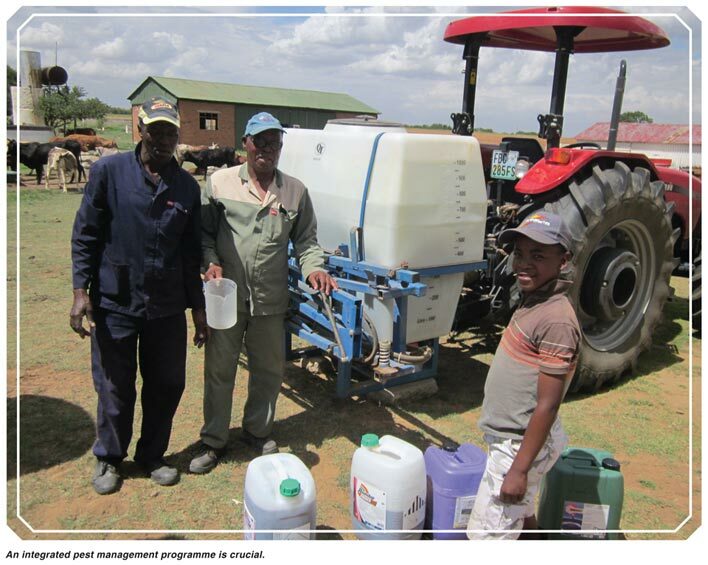 It is important that spraying of a contact or systemic chemical be applied before the maize plants become too tall for the use of a tractor mounted spray rig. The control and management of potential stalk borer infestations should be part of an Integrated Pest Management or IPM system planned and implemented on your farm. The main goals of IPM are to increase profits by reducing production costs at the same time as keeping pest losses low. Please investigate the possibilities of using a scientific and planned approach for your farming operation and all the different crops planted. The three keys to a successful IPM programme are first to scout, or continuously inspect and systematically evaluate your crops throughout their growth cycle regularly, in order to identify pests. It is important to acquire the knowledge so that the larval, adult and egg forms of various economically importance can be correctly identified. Secondly, to only take control measures when there is a pest population, or weed infestation, approaches a profit threatening or economic threshold. In the calculations above a 10% infection, which is a rule of thumb threshold for control to be implemented, implies a potential loss of R1 260 per hectare. If total spraying costs are less than this per hectare it would be advisable to control the problem which will also be more cost effective at this stage. Thirdly, when control is required apply the lowest effective amount of pesticide using equipment that is correctly calibrated. The main control measures include chemical control by contact, direct spraying of the poison on the insects or systemic products that are taken up by the plant and kill the larva deep in the leaves or stem, cultivar choices, cultural practices such as eliminating the over wintering of larvae in the old stalks or biological control. Chemical costs for contact or systemic chemicals are about R150 per hectare for the chemicals which must include a fixer mix. Even by adding R500 a hectare for applying the chemicals it is economically advantageous to implement control at a 5% threshold infestation rate. The introduction of transgenetic or genetically modified maize cultivars has revolutionised the control of stalk borer infestations with about 72% of the maize cultivars planted to Bt types. Be sure you understand the requirements and need to plant refuge or buffer zones of non Bt maize in blocks or strips through your lands so that resistance to the Bt maize does not build up rapidly. Current research indicates that we are already experiencing resistance by the insects to being effectively controlled by the Bt varieties. Farm responsibly in this regard and try to plan a crop rotation system that allows a change from using genetically modified maize and broad leaved on a continuous cycle. Crop rotations are also important to improve soil and reduce resistance to chemical control of certain weed types. Effective and continuous scouting of your newly planted maize crop, in the early growth stages will ensure timely control of any stalk borer infestation and the resulting future yields at harvest time.